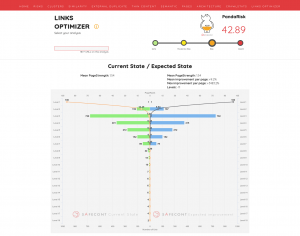 Celebrating the 3 years since Safecont was born we launched a new breakthrough functionality, we present “Links Optimizer”. The first SEO tool that will tell you in a completely automatic way, how to optimize the architecture and interlinking of your website, so that you get the maximum benefit from your linkjuice. 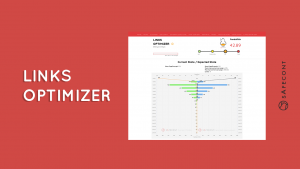 Optimize your architecture 100% with Links Optimizer. What architecture should you choose? This will no longer be a problem. As there are a great variety of web types, types of architecture and different business / product decisions, the complexity of developing a tool for this function is enormous. But there is no doubt that it was something that SEOs needed, an analytical and objective way of developing an SEO architecture and an interlacing system between the pages of our domain. After a long time working on different models we found the solution. It is not necessary to modify all your architecture, or important changes in design / menus. We do not need you to give us any previous information, since what the system does automatically after the crawl is to build the links that your site would need to optimize the equidistribution of linkjuice to all the pages of your site, improving at the same time your architecture and consumption of crawl budget. 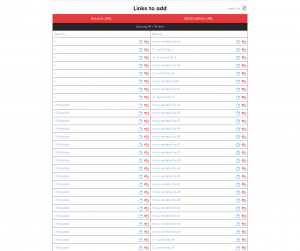 Links optimizer will propose new links for you to add in different pages of your website. These links are previously calculated when Safecont automatically tracks and analyzes your site. In this graph we compare the current / real situation of a website with what would happen if you add the links that we propose. Left side is the current status of your domain: It will tell you the average of PageStrength (normalized internal Pagerank) of the pages of your domain, the number of URLs per level, and PageStrength in each level. Right part is the result that you will get after implementing the links that you propose: Average of PageStrenght of the domain, average percentage improvement of your pages, maximum improvement in a url achieved, and number of levels compared to the original. Improvement of 9% in PageStrength medium, Maximum improvement in a page of 3483%, and Reduction of 11 depth levels. PageStrenght: Relevant page level evaluations comparable to Pagerank. The value of maximum relevance is one hundred, and the minimum is zero. Some levels can decrease your LevelStrenght (Relevant assessments of the different levels of depth) but the PageStrenght of the domain will increase, the depth will be reduced, and the search will be improved by the search engines. In this table we show the different links offered by Links Optimizer. You will have to add them to your pages, but you can use the anchor text you want. The links are shown in pairs Origin and destination of each link. You have two search boxes to filter by “Origin” and see all the links that you have to add to a page, or filter on target pages to see in which pages you must add a link to a certain page. You can also export the table in its entirety in CSV format. Adding these links will maximize the PageStrenght average of the URLs of your website. You will improve your interlinking, the consumption of crawl budget, and the PageRank that reaches your website via external links will be distributed optimally to the rest of your domain. The links can be added anywhere in your pages, they can be in the footer, in a drop-down, in a list, together or in several modules … you choose which is the best place to place them on your website. 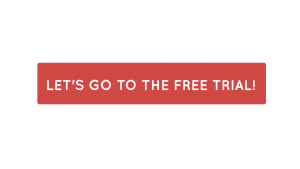 This new feature will be available without additional cost in all our packages, and for all our customers. If you have any questions please get in touch with us through the comments of this post or by Twitter.